It was a very simple hike on a very simple trail with a very simple goal: get the boys on a hike and see how they do. The boys had just turned 9 months old the weekend before, and we were sure (after some test runs in the house) that the boys had the strength and stamina to support themselves in the baby carrying backpacks that we had purchased for a duration long enough to complete a short hike. We have done some reading on tips to help get your kids to experience the outdoors and enjoy hiking. 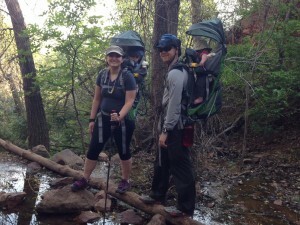 Some advice that really resonated with us was to try and limit the stroller use. Basically, the thinking is to let the kids see that ‘we are the kind of people who walk.’ So, in the carrying packs they went. Kristina with Kade and Jason with Connor using the Deuter Kid Comfort Air kid carrier packs at Matthew Winter’s Park August 23rd, 2015. Our two little guys are naturally explorers. When they were tiny and immobile, they wanted to be walked around rather than be sat with or snuggled. When they were old enough to roll around, they preferred to do that than play with their toys. When they learned to crawl, we found they would much rather be crawling and exploring than anything else. They are constantly in motion. While that probably describes a great many kids, we wanted to honor that by allowing our hikes to be opportunities for exploration, as well. That means toning down our expectations. They need an opportunity to ‘ooh’ and ‘aah’ at things. We aren’t going to move as fast, and the destination is not the purpose. As alpinists, the goal is – at least in part – the destination (usually the summit). For these hikes, it’s more about how much time can the kids take before they get tired, bored, uncomfortable, or all three. We limited our first hike to an hour round trip, just heading up into the foothills at Matthew Winter’s Park, south of Golden. We also tried to time the hike during a part of the day that would be most conducive to a positive experience for the kids. We drove across town after their morning routine – of waking up, getting changed, getting fed, playing, and then getting changed again. So our drive coincided with their morning nap (which follows after that routine). We wanted the hike to be when they were well rested, well fed, and not feeling like it came at a ‘weird’ part of the day. This mid-morning time is usually when they would be going to the zoo, or the museum, or anything else. So, hopefully this felt like just another outing in terms of fitting into their day. All of this was pointing at making this a really positive experience for our boys, low on stress and high on exploration. I can say that the kids were wonderful. They weren’t fussy, they reached out for things. Kade, in particular, was chatty and upbeat. Connor was a bit more reserved and inquisitive. This fits with their respective characters. So, day one is in the books, and Kristina and I feel it went well. So much so, that we’ll try to get out again soon. I’m sure we’ll have bad days as well as good ones, but we’ll be trying to make sure the good far outnumber the bad.